I hope you are having a great week so far. Are you ready for the big Memorial Day weekend? It looks like we have some rain in the forecast so we may be staying a little closer to home. 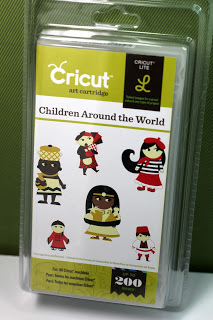 Maybe, I will be able to get back in my craft room some and craft...fingers crossed?! The card base is Spellbinders 5x7 Reflective Moment die followed by Spellbinders Decorative Labels Eight die. 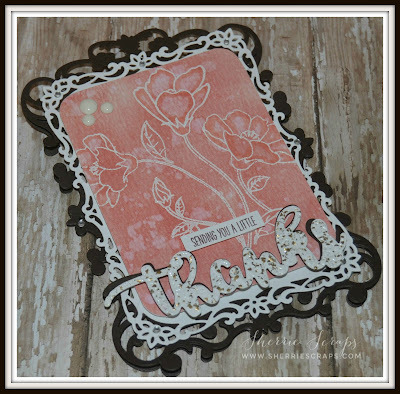 I created the background using Tim Holtz Tattered Rose and Victorian Velvet distressed inks and a little water. The flowers are stamped with My Creative Time's~Just Because stamp set and heat embossed in white. The sentiment is My Creative Time's~Fun Notes stamp/die set. 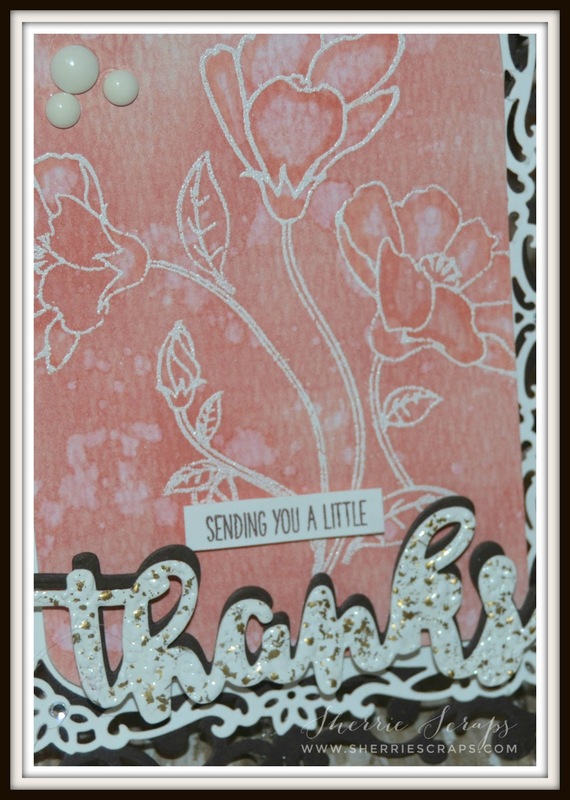 The "thanks" was die cut a couple times for extra dimension and embossed with white shabby embossing enamel. 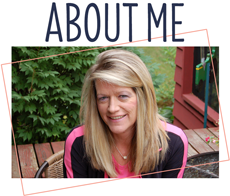 Oh my gosh, Sherrie, this is so elegant and gorgeous!! Wow!! I absolutely love, love the watercolor background!! The colors are amazing!! I love the embossed flowers!! The frantaged thanks is such a perfect touch!! This is stunning my friend!! I just adore it!! Thank you so much for playing along at Scrapy Land and DL.ART!! Sherrie - this is simply GORGEOUS!! 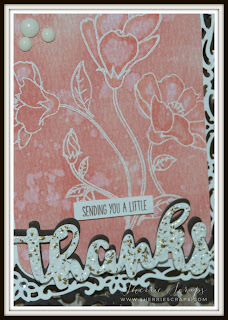 LOOOVE your beautiful card - the Spellbinders die is so pretty and your water coloring looks fantastic! Beautiful job on your card! MCT products look great with the Spellbinder frame. Very pretty. I sure do like to play with my distress inks too. Need to pull out my Spellbinders though. I think they have been a little neglected. What a gorgeous card! I love the soft, pretty pink background and those flowers are just perfect. The mats are so detailed and are just beautiful - the black one just frames your card perfectly! Ohhhhhhhhhhhhh wow!! This is gorgeous! LOVING the colors!!!!!!!!! I saw this beauty on FB and it is truly STUNNING my friend!! Awesome texture and I love the watercolor background. You did an awesome job! Such a beautiful card and design! I love the heat embossed flowers, they look so amazing! The Spellbinders frame is gorgeous and very elegant! This is such a gorgeous card, Sherrie! The frames are absolutely beautiful! Wow, how gorgeous! I just love those colors together! The white really looks lovely peeking through! I hope you have a great weekend. Gorgeous!!!! LOVE the colors.... wow Sherrie.... so gorgeous! Love those dies too, very intricate ....and I sure do hope the rain can hold off if you have plans, especially outdoors. We have beautiful weather here... high 90's... and as you know, I live at the beach so all the vacationers came in between Thursday and yesterday so it is packed here. 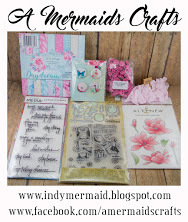 If the weather doesn't hold up for you then I hope you get to craft away in your craft room! Enjoy the weekend my friend! Love the layers and the die cuts, nicely done. Good Luck! I hope we see you again!! 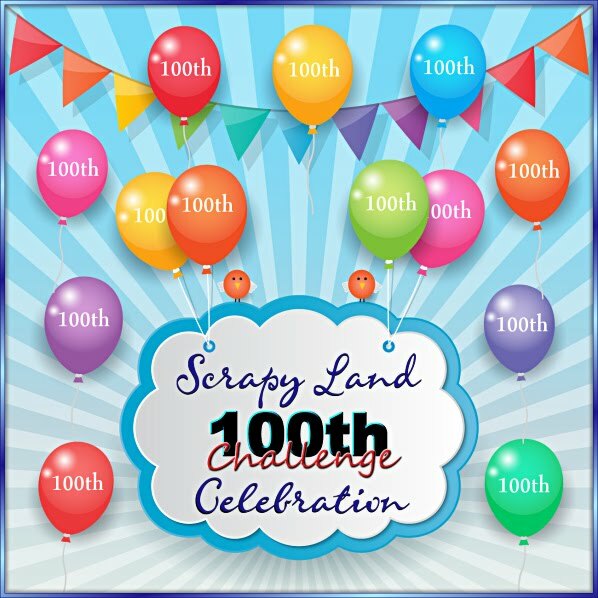 Thank you for joining us at Scrapy Land. Your card is beautiful Sherrie, I love the dark frame around your flowers. I love it. Thank you for entering the DL.ART THANKFUL THURSDAY challenge #180-“Flowers” for this challenge. Have a blessed day and a wonderful Memorial day. 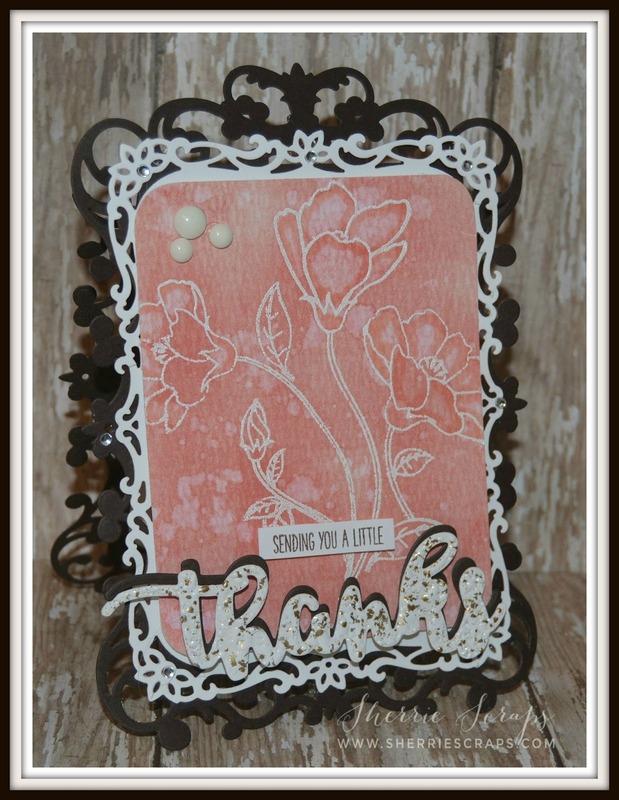 So pretty - love the black frame die cut and the lovely background you created! Your card is just beautiful, I love the white embossing technique!! Absolutely beautiful. Love the water coloring and stamped flowers. Well done my friend.